While Futo, Japan has in the past been known as a village where dolphins are slaughtered, it now has a far brighter distinction. It is the village from which dolphin and whale watching cruises are departing in concert with a BlueVoice.org effort to replace dolphin slaughters with eco-tourism. In October 1999, the village of Futo Japan became infamous around the world for the brutal slaughter of a pod of some 75 dolphins. Video of the slaughter of appeared on television screens around the world. The images of the bottlenose dolphins being pulled from the water to have their throats cut caused an avalanche of protest against this barbaric practice. Letters, faxes and emails expressing outrage poured into the Japan Fisheries Agency, the office of the Prime Minister and the Fishing Coop at Futo. The public outcry caused a halt in the dolphin hunt for 5 years. But now, the fishermen plan to hunt dolphins again. BlueVoice has been working in Futo to replace dolphin hunting with a dolphin watching business. While eco-tourism brings money to the entire community ­ hotels, restaurants, souvenirs vendors, etc., dolphin killing provides money for only a select few. And, it puts dolphin meat, which is highly toxic, into the food markets of Japan. Mr. Izumi Ishii, once a dolphin hunter, has vowed never to kill dolphins again. His father, grandfather and great-grandfather had hunted whales and dolphins. It took tremendous courage for him to denounce a centuries old tradition in a country where tradition is revered. In 2002 he launched the first dolphin and whale watching trip out of Futo harbor. He was accompanied by eco-tourists and journalists from Japan, Australia and the United States. The world was watching to see if such a venture could be a success. And the first trip was a tremendous success, a sperm whale rose and lingered for some 45 minutes. It was both curious and relaxed moving to within a few feet of the boats. Perhaps a dozen Japanese television crews and many print reporters were sprayed by the exhalation of the whale. On the whale watching boat delirium reigned. Stories of the successful inaugural whale/dolphin watching expedition were all over Japanese media. Mr. Izumi Ishii was once one of the most outspoken advocates of the capture and killing of dolphins. But Ishii-san had changed. "I heard the sound of the dolphins crying as they were killed. I could not bear it," he said in describing his reasons for converting from dolphin killing to dolphin watching. "The value I now see in dolphins is not the value of their meat, but of the wonder they incite in us. "I had been moved by the sight of pods of dolphins and sometimes forgot my job as a hunter even when I was hunting them. I would like to convey my excited feelings to people through dolphin watching." Ishii-san is a businessman and now considers that he will make more money with dolphin watching than hunting. Dolphin watching will bring financial benefit to travel companies, hotels in the area, restaurants and souvenir stands as well as the fishermen themselves. A dead dolphin is worth only $300 for its meat. Live dolphins attracting tourists are worth many times that sum. He has also seen films about dolphins that caused him to change his original conclusions that dolphins are just fish. He now realizes they are highly intelligent, air breathing mammals and appealed to stop the cheating and the violations of the rules governing dolphin hunts. Ishii had realized that in some cases the cooperative was instigating dolphin hunts, which were illegal. When he complained, members of the Fishing Cooperative denounced him and tried to get him to resign as a fisherman, even to banish him from Futo. But Ishii was encouraged when Japanese and international conservation groups spoke positively of his courageous actions. The staff of both the National Fishery Agency and the Fisheries Section of Shizuoka Prefecture ignored his appeal that the fishing coop should stop hunting in violation of quotas. "It is very ironical, but the attitude of the National Fishery Agency toward me made me what I am today," said Ishii. BlueVoice.org and other international conservation groups have pledged their support for his endeavor and brought groups of tourists to help him inaugurate dolphin watching. 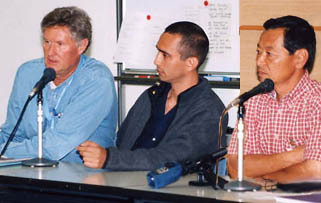 In 2003 BlueVoice brought Mr. Ishii and Mr. Inaba, a member of the city council of Ito County to Monterey, California. Here they were able to see first hand the enormous benefits a successful whale watching business could bring to a city. Mr. Inaba was impressed and promised to do all he could to promote dolphin/whale watching in Futo and to end the dolphin slaughters. Mr. Ishii does not want to keep his new business exclusively for himself. "The most important thing is that I succeed in the dolphin watching business. If I can succeed in it, other fishermen in Futo will follow me." That would truly put an end to the killing of dolphins at Futo and provide an example for other villages where it is still practiced. If the dolphin hunt in Futo is not stopped, it jeopardizes this successful endeavor. Please lend your support to Mr. Ishii by expressing your condemnation of the dolphin hunts. Let the Japanese authorities know you abhor the capture and killing of dolphins. dolphins. Click for contact information to help save the dolphins.